Laissez les bons temps rouler! This French saying means “Let the good times roll!” It is the mantra for Mardi Gras and perfectly captures the essence and feel of this lively holiday. One can’t hear this mantra without picturing the flying beads, jazz music, double decker floats, and purple, green, and gold galore. The Pelahatchie High School Band experienced this when they were invited to march in the annual Biloxi Mardi Gras Parade. This is the second time they have been invited. The parade was on Saturday March 2, a few days before Fat Tuesday. 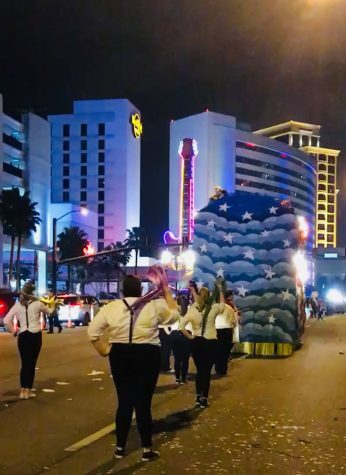 The nighttime parade was sponsored by the Krewe of Neptune, which is one of the largest of the many Mardi Gras Krewes along the Mississippi Gulf Coast. The parade is steep in Mardi Gras traditions, especially being only about an hour and a half away from the hub of Mardi Gras, New Orleans. The parade is led by the Mardi Gras King and Queen riding on their grandiose floats and waving to the crowd. It’s a big production and is an important tradition for many people. There were around eighteen bands in attendance. Many came from Mississippi, but there were also bands from all across the Southern states, like Louisiana and Alabama. Decked out in New Orleans brass band attire and with beads swinging from their necks and instruments, the PHS Band played a jazz rendition of the 80’s hit “Sweet Dreams (Are Made of This)” by the Eurythmics as they marched down the streets. Though the large multitude of people gathered along the parade route seemed daunting at first, the band grew more comfortable as they went along. The crowd would often sing along, providing for an engaging experience. “I really enjoyed how we could bring a smile to the faces of all those people! It’s so fun when you are doing something you love,” said Gracie Thompson, a member of the color guard. There was a wild energy in the air, and the band reciprocated that energy and played with vigor, though many were absolutely exhausted by the end. The band was rewarded a nice sum of money for their participation in the parade.